Robert B. Dunlap earned his B.A. in Psychology and his Juris Doctorate from Louisiana State University. With more than 30 years of experience, Mr. Dunlap has handled a wide variety of legal matters, including oil and gas law, wills and trusts, family law, personal injuries, and commercial and business law. He has been selected as a top lawyer in SB Magazine time and time again. Mr. Dunlap became interested in law because of his passion for solving problems for people. In high school, he was a member and president of the debate team, and he was drawn to the challenge of transforming a hopeless situation into an agreeable solution. He ultimately chose to pursue law because of the intellectual, creative, and interpersonal challenges it poses. To this day, he uses his intellect, creativity, and strong interpersonal skills to help his clients with their legal needs. Mr. Dunlap was admitted to the Louisiana State Bar in 1982 and the Texas State Bar in 2015. 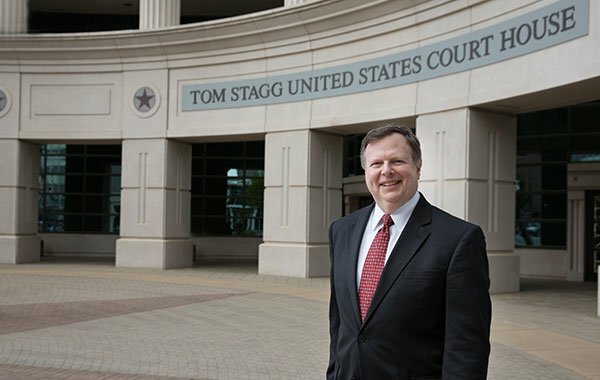 He has since served the communities of east Texas and west Louisiana, bringing his trusted reputation and personalized service to every legal challenge that comes his way. His favorite part of his career is working side by side with clients to solve their problems. My mission is to provide quality, cost-effective legal representation. For two years, he served as the Attorney General for the Commonwealth of the Northern Mariana Islands. In this position, Mr. Dunlap supervised matters involving criminal law, immigration, labor cases, and civil litigation. He has appeared and testified before the United States Senate Committee on Energy and Natural Resources, and he sued President Clinton over the implementation of the Compact Impact Agreement with the United States. After leaving the Attorney General’s office, Mr. Dunlap practiced with the largest firm in the Pacific, handling employment, construction, and personal injury law. Locally, Mr. Dunlap has shown his dedication to the community in a number of ways. He’s involved in ongoing peer education and seminar presentations, and he supports and/or volunteers with many local organizations. He has served as Chairman of the Board for Goodwill Industries of Northwest Louisiana, seven years as the president of the Caddo Magnet Lacrosse Club and as president and board member of The Shreveport House Concert Series. Ultimately, Mr. Dunlap’s experience is distinctly unique. He’s negotiated international agreements with the Republic of China, drafted mortgages for submarines in Thailand, still fully immerses himself in any case — big or small — with each one of his clients. He’s not a conventional lawyer, and his unconventional thought process allows him to take on the cases that other lawyers may shy away from. In his free time. Mr. Dunlap greatly enjoys music, cycling, hiking, travel, and adventure. He has raised three sons, and he was always heavily involved in their childhood. Shreveport and Bossier Chamber of Commerce CNG Symposium (May 2010, Bossier City, Louisiana), "Federal and State Tax Incentives for Conversion of Natural Gas Vehicles"
Petrohawk Energy (February 2010, Shreveport, Louisiana), "Imprescriptible Mineral Servitudes"
Southeast Shreveport Rotary Club (April 2008, Shreveport, Louisiana), "Local Impact of the Haynesville Shale and Basic Mineral Rights for Landowners"
Inns of Court, Federal Bar (May 2008, Shreveport, Louisiana), "Oil, Gas and Mineral Lease Negotiations"
Federal District Bar Conference (April 1997, Saipan, CNMI), "Qualified Immunity in Section 1983 Actions"
National Business Institute, Inc. (September 1993, Shreveport, Louisiana), "Fair Debt Collection Practices Act and Pre-litigation" and "Preventive Collection"
Louisiana State Bar Association (January 1994, Shreveport, Louisiana), "Louisiana Workers’ Compensation Act"
Louisiana State University (Spring 1990 - 1993, Shreveport, Louisiana), Instructor, Paralegal Studies "Debtor/Creditor Relations"
American Institute of Banking (Spring 1989, 1991, Shreveport, Louisiana), Instructor, "Law and Banking"